They say a picture is worth a thousand words, but sometimes a video is worth a thousand laughs. 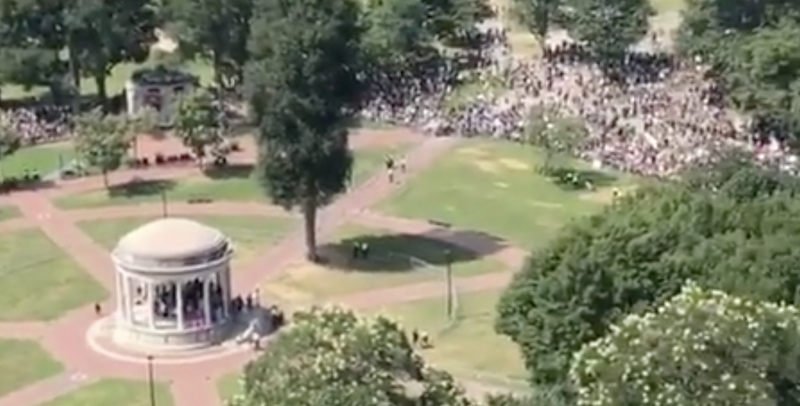 Evan McMurry shared a video on Twitter Saturday showing the disparity between the “Free Speech” protesters in Boston (the likes of whom could fit in a teaspoon—or a small gazebo) and the counterprotest where tens of thousands took to the streets against hate. Patrisse Cullors, a co-founder of Black Lives Matter, released a statement on the counterprotest, organized by a half-dozen chapters of the global Black Lives Matter Network, the local Boston and Cambridge BLM chapters, and Monica Cannon from the Violence in Boston coalition. “It is an incredibly sad day in America when Black people and our allies have to stand in solidarity to remind the country that we have unalienable human rights. White supremacy cannot be equated to Black people fighting for their basic human rights,” said Cullors. “My hope is that today’s counter protest will begin to change the fabric of America. Until we take on white supremacy at its core, we are further away from a society which can honestly stand for freedom and equality for all,” she added. Well, folks showed up and showed out (in a good way). Bonus: A tuba player trolled neo-Nazis with goofy music.